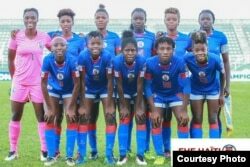 Haiti's teen women's soccer team made history this week when it qualified for the country's first FIFA Women's Under-20 World Cup berth. 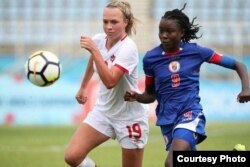 Star midfielder Sherly Jeudy scored the winning goal to lead the team to a 1-0 victory over Canada in the third-place game Sunday at the CONCACAF Women's Under-20 Championship, held in Couva, Trinidad and Tobago. "I'm very happy I was able to score the goal, but I'm even happier for Haiti as a country," Jeudy said in a postgame interview. "I was just so very happy because we were able to qualify." Haiti has not qualified for the World Cup since 1973, which led to the men's national team's only appearance in the FIFA championship series, in 1974. The team was eliminated in the first round. Both inside Haiti and in the diaspora, Haitians reacted happily to the news on social media, posting photos and videos of the team on Instagram, Twitter and Facebook with congratulatory messages. "Bravo, ladies, we respect the sacrifices you made [to win] because soccer in Haiti is not easy," Ansitho Pierre Louis posted in Creole on the Haitian Soccer Federation's Facebook page. "I congratulate you, hang in there, keep working so we can shine at the World Cup. Much respect." VOA Creole reporter Pierre Nazon Beauliere caught up with the players during a stop in Miami before they returned to Haiti. Goalie Kerby Theus discussed their strategy heading into the match against Canada. "We were very motivated and focused [going into the game]," Theus told VOA. "We weren't worried about the loss to the United States [in the semifinals] . ... We set qualifying for World Cup as our goal. We never entertained the thought of losing. It was important to us to achieve this goal for Haiti." Team physical therapist Aldride Joseph talked about the significance of the win for Haitians. "The win means so many things to us, not just socially but also politically," she told VOA. "Despite our country's problems, you can see everyone is sending the girls congratulatory messages and expressing their joy — that means so much to us — and we're going to keep working for the win [at the World Cup competition]." Joseph said it was more than luck that helped Haiti clinch the berth. "We worked hard for this," she said, adding that the women train twice a day to perfect their game. Haitian Football Federation (FHF) President Dr. Yves Jean Bart said he was extremely proud of the athletes' performances. Jean Bart launched Haiti's women's soccer effort before the devastating Janurary 2010 earthquake that left hundreds of thousands dead. He said after the disaster that many countries stepped forward to help the federation get back on its feet. He said the FHF's goal now is to train the girls just like the boys and to also provide academic support in addition to the rigorous athletic training. "We're not going to France just to look around — we are aiming to win," Jean Bart told VOA Creole. France will host the 2018 event. "I hope we will get to a point where we can face any team from any nation." The U-20 team's return to Haiti was full of pomp and circumstance. Haitian President Jovenel Moise and Prime Minister Jacques Guy Lafontant met the team at the airport in Port-au-Prince with flowers, handshakes and praise for a job well done. With an eye toward France in August, goalie Kerby Theus had this message for the fans: "Keep encouraging us, keep rooting for us and you'll see — we'll do even greater things in the future." Pierre Nazon Beauliere contributed to this report.